The 10 Best Sports Bars in Rhode Island! Searching for a local bar to catch the big game? Head out to these Rhode Island sports bars for great beer, good food, and excitement with likeminded sports fans. From dive bars to upscale outdoor hot spots, you’ll find what you’re looking for at these 10 great sports bars in the Ocean State. This neighborhood pub is a favorite local watering hole that offers a slight Korean flair. Try the Korean wings, Bibimbap, or crispy sweet potato fries while watching the game on one of many screens around the bar. Easton’s Point is located just a little ways off from Easton Beach and offers delicious local food that feels home-cooked. Go for a delicious lobster roll along with your drinks. You might also be pleased to know that Easton’s is dog-friendly for those sitting outside, too! Come for the beer, and stay for the live music, karaoke, and sports games spread across the bar’s 20 high-definition TVs. The new owner, Matt, has used his culinary skills to take the bar food to new heights—try the wings or the calamari along with your drink! The Brass Monkey combines a casual environment with a fun, creative menu. You’ll certainly want to try the 35 cent wing specials for Thursday night football games, or half-priced wine and “toxic” trivia on Wednesdays. This pool hall and sports bar is located on Smith Hill and is always playing great music to go along with their pool games. If you’re looking for a laid-back night that combines drinks, pool, and pals, this is the place to be. A beachside sports bar? What else could you need? Locals will enjoy the Thursday dinner and wine special, and those around on Friday and Saturday will love the $15 prime rib night! Head upstairs for the sports bar, or go back downstairs for calmer dining experience. 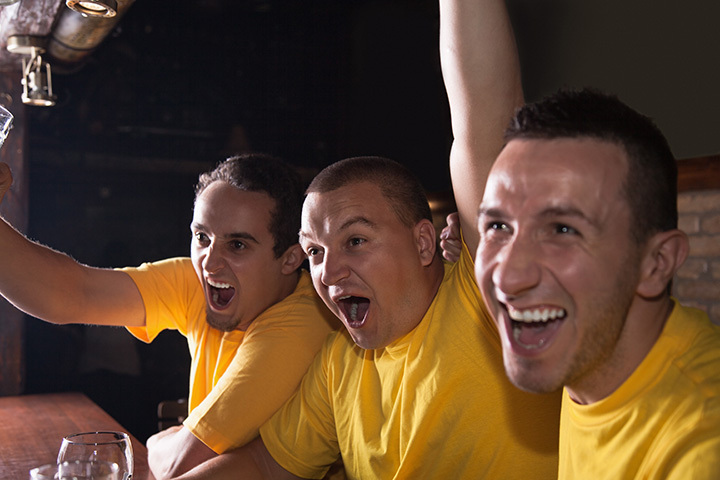 Grab a beer, order a burger, and be ready to enjoy a night of sports at Rhody Joe’s. The bar offers viewing options across 17 flat screen televisions and has 24 beers on tap. Make sure to check out the calendar for great events, like Ladies Night where you can get 25 percent off most entrees. For a more local take on Newport, head to downtown’s Pour Judgement, open daily until 1 a.m. Those visiting from out of town will feel right at home alongside those in town to watch the game. There’s plenty of space to watch the game with some friends or alongside new pals at the End Zone. This bar doesn’t try to be anything more than what it is—a dive sports bar—but the service is very friendly and the music is loud. Come back on Friday for the all-you-can-eat fish and chips special. Enjoy cocktails and appetizers all with an incredible view from Newport’s prime outdoor bar. Check out live music most weekends, and sample appetizers from the restaurant’s signature raw bar, served most nights until 11:30 p.m.
View more Rhode Island Bars and Saloons.